Although tourism has slowly developed here over the last twenty years, fishing is still very important to the economy of the village, especially now there are lots of visitors to dine on the catch of the day. If you are up early, you can see the fishing boats return to harbour with their haul. As you watch them unload you will know that tonight, after a long day in the sun you will be sitting in a taverna on the attractive tree-shaded waterfront with a glass of local Robola wine, watching the sun set as you tuck into the freshest lobster, sea bream or sole – heaven! 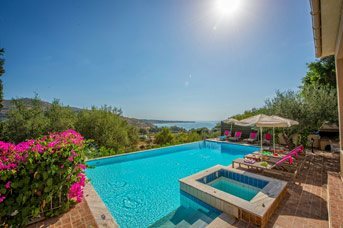 If you can drag yourselves away from your lovely private pool at the villa, Agia Varvara, the main beach here is a relaxing place to spend the day in a lovely setting of pine trees, eucalyptus and roses – imagine the perfume! The rocks and rock pools are a source of endless fascination for the bucket and spade brigade. The horseshoe shaped beach has a Blue Flag so it is clean and safe with plenty of sun loungers and parasols, and there are some bars and restaurants along the seafront in case you are in need of refreshment. A smaller beach, Agia Barbara is just a short stroll away. Both beaches have great views of Zakynthos and the Greek mainland.Although tourism has slowly developed here over the last twenty years, fishing is still very important to the economy of the village, especially now there are lots of visitors to dine on the catch of the day. If you are up early, you can see the fishing boats return to harbour with their haul. As you watch them unload you will know that tonight, after a long day in the sun you will be sitting in a taverna on the attractive tree-shaded waterfront with a glass of local Robola wine, watching the sun set as you tuck into the freshest lobster, sea bream or sole – heaven! 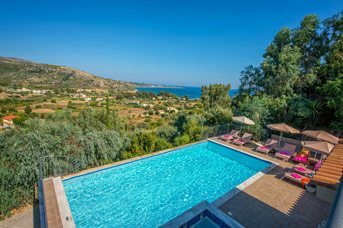 If you can drag yourselves away from your lovely private pool at the villa, Agia Varvara, the main beach here is a relaxing place to spend the day in a lovely setting of pine trees, eucalyptus and roses – imagine the perfume! The rocks and rock pools are a source of endless fascination for the bucket and spade brigade. The horseshoe shaped beach has a Blue Flag so it is clean and safe with plenty of sun loungers and parasols, and there are some bars and restaurants along the seafront in case you are in need of refreshment. 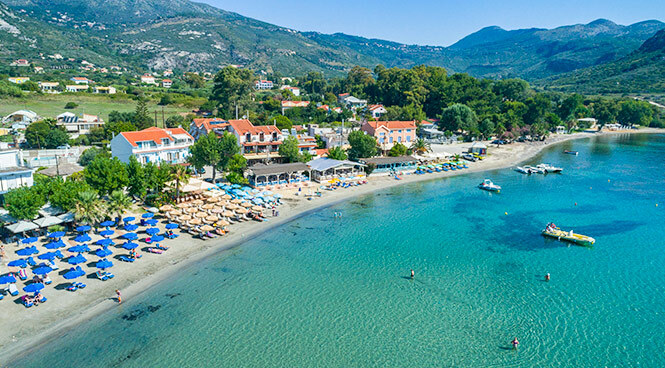 A smaller beach, Agia Barbara is just a short stroll away. Both beaches have great views of Zakynthos and the Greek mainland. Katelios makes a good base for exploring the island. You can hire a car or a boat in the village, or there are organised tours available if you would like someone else to do the driving. For the intrepid explorer, a daily bus is available to Skala and Poros along the coastal road and in the other direction to Argostoli (but not on Sundays or Bank Holidays) or there is a water bus that will take you to Skala or on to Poros. The whole area is also a protected turtle breeding zone. The lush green hills behind Katelios’s beaches provide a beautiful backdrop and many interesting paths for walkers. If you stroll along the river, shaded by plane trees, you’ll see wild flowers and have an good chance of spotting some rare birds. There’s no shortage of walking trails in the rolling hills which will take you through lemon and olive groves past old watermills, and 12th century churches, often just ruins. The picturesque coastal paths are great for long walks interspersed with swimming, sunbathing and picnics.